We spend roughly one third of our lives at work, not to mention all those hours mulling over it in our spare time. As a society, how happy are we at work? The statistics on workplace happiness are pretty depressing. Less than 50% of Australian workers are happy in their jobs. When I started my career in I.T., I adored my job. It was meaningful, interesting and stimulating. I loved the camaraderie and being part of a friendly and supportive company culture. My fellow team-members and I laughed often, and we socialised both at work and outside work. Over the ensuing years, I experienced a few soul-destroying jobs. There was one job in particular that really took the cake. No matter how hard I tried to reframe the situation – that I was lucky to have a job in a time of serious unemployment – I still hated this mind-numbingly boring job. My colleagues and boss were nice people, but the atmosphere was so quiet and solemn, that some days I could have sworn I was working in a morgue. I felt like an invisible human “resource”, rather than a recognised and valuable human “being”. Before long, I discovered what it felt like to be a clock-watcher. 3pm was the hardest time of the day – that’s when it felt like time stopped. Would you believe that the Scandinavian countries (which also happen to comprise some of the happiest countries in the world), actually have a word for the feeling of Happiness at work? That word is arbejdsglaede. As opposed to the Japanese, who have another word: Karoshi, which means death from overwork! The benefits that happier employees bring to a business are profound. Happier workers are more energised, more engaged, more creative, they solve problems more effectively and collaborate better with their colleagues. 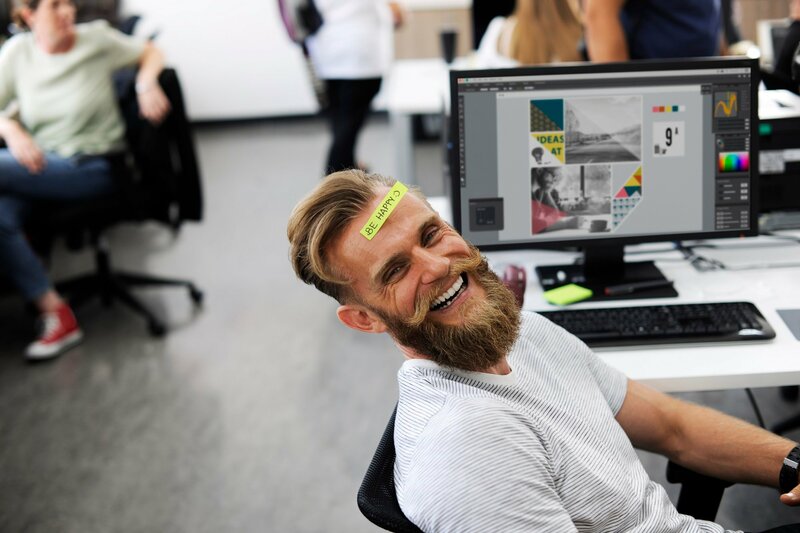 A study from the University of Warwick reveals that happy and engaged staff are 12% more productive, while unhappy staff are 10% less productive. How engaged and productive do you think I was in this job-from-hell, when I had one eye on my work and the other eye on the clock, waiting anxiously for the hands to strike 5:30pm, so I could bolt out the door?! You don’t need to be a rocket scientist to deduce that if individual happiness and productivity goes up, so too does organisational productivity. The bottom line is: Happiness is good for the bottom line! Happy employees are more loyal to an organisation. They enjoy working there, and stay twice as long there. When employees chop and change jobs, there are significant costs incurred to the business in recruitment, training and the new employee getting up to speed in the job. Employee retention skyrockets when happiness at work is the norm. Emotions are contagious. How do you feel when you interact with grumpy sales people? Do you want to buy from them, or do you want to run for the hills? As Harvey Norman’s Gerry Harvey says: “Happy workers mean happy customers”. Happier salespeople sell more. Happier workers are more cheerful, upbeat and optimistic – their customers, clients and colleagues all enjoy working and doing business with them. Your employees are your greatest asset. As a manager or business owner, you owe it to your employees to do your utmost to create an environment that is fully conducive to them feeling fulfilled, motivated and energised when they are at work. The importance of harnessing the power of fun and happiness at work cannot be overstated. Richard Branson, head of Virgin and one of the most successful business people on the planet, has said: “Fun is the secret of Virgin’s success”. We all need to take a leaf out of Richard Branson’s book and do whatever it takes to transform our workplaces into happy, fun and productive places. Susan Weser is the founder of Australian company, Empowered2Thrive. She is a corporate wellness trainer, coach and consultant, who loves to empower and inspire people to be healthier, happier and more productive – both in the workplace and in life.